So how much do you love gaming? I love it enough it enough to get out of bed early on the weekend to cross town to attend the biggest 40K event (in Melbourne, anyway). Before this weekend I have had exactly one game of 8th edition 40K. Not a great apprenticeship I know, but I figured at 12 or pages of rules, well, how hard can it be? Pretty hard, it turns out. I took a 5th ed war band to an 8th ed gun fight. While I had six fun games, I had my arse handed to me every which way but winning. My opponents were all great. There were some very cool armies on show too. There are a fair few pictures on Instagram using #arc40K if you want to check some out. Here is day one. Imagine ugly detail of poor chaos deployment, ineffective shooting, failing to reach close combat and forgetting to use special rules and upgrades, and you get the general idea. I did have fun, but one thing really bugged me about the current rules. Basic tactics just don’t seem to matter. Flanking is pointless, terrain doesn’t matter. And the command bubble type powers seemed to combine with big units to see every game end up as two, then one, big blob. Even so (and even while getting thrashed), I still laughed and shouted along with the rest of the participants. It was 40K after all, and it is nothing if not boisterous. I’ve had my fill of the grim-dark for now. I’m content to leave those that enjoy 40K to roll their buckets of dice. There is a game for everyone out there. Maybe we’ll play one together sometime soon. This last Sunday saw Operation Bear, the largest Bolt Action tournament held in Melbourne so far. Thirty players assembled at Good Games for a cracking day of gaming. The hook of the day was 1,111 points using a single reinforced platoon (and no theater selectors) extended to allow one additional 0-1 choice provided nothing was repeated. So, you couldn’t take two Panzer III, but you could, for example, take a Tiger I and a Wirblewind. A silly example, of course, because that is almost 600 points, more than half of your budget. So, of course, that’s what I did. There is a theme to the list. After the fall of Monte Cassino and the breakout from ANZIO, the 508 Heavy Panzer Battalion was used in penny-packets in support of 10th Army as they retreated to new defensive positions north of Rome. My force contained Heer Grenadiers, a unit of Fallschirmjager and a Tiger I accompanied by its anti-air asset, a Wirblewind. This is somewhat of fudge, since while Tigers were often defended by flak units, I don’t think Wirblewinds were deployed in Italy, or even available in June/July 1944. But I’ve got the model and I had never deployed it before. It was a fun day. There were three games, two with objectives and one for kill points. I feel this mix is pretty much optimal for three-game tournaments and encourages a more balanced approach to list building (or at least discouraging single-trick lists). By the luck of the draw I faced two other German Players (who I beat), and a Polish Airborne list (who carried the day). Three fun opponents, three good games, a generally good buzz and lots of beautiful armies to look at on the day. It is hard to ask for much more. If you want to hear more about Operation Bear and things Bolt Action, I’m one of the guests on the Cast Dice Podcast discussing the day in more detail. Maybe I’ll see you at tournament sometime. Life can really get in the way of your hobby at times. I did managed to sign up for a tour of duty for the May Victorian Bolt Action League event. Three games in a day, held at the excellent House of War in Ringwood. I liked how Tristan organised the day. Rather than the usual swiss chess sort of thing, we were divided into axis and allies, so no blue on blue. He had also appointed overall commanders, who (in consultation with their team) allocated people to tables. Each table had a different mission, so the terrain matched the mission. Both terrific things to bring to an event, and greatly lowered the stress levels because there was no “top-table”. I took my Germans, of course. 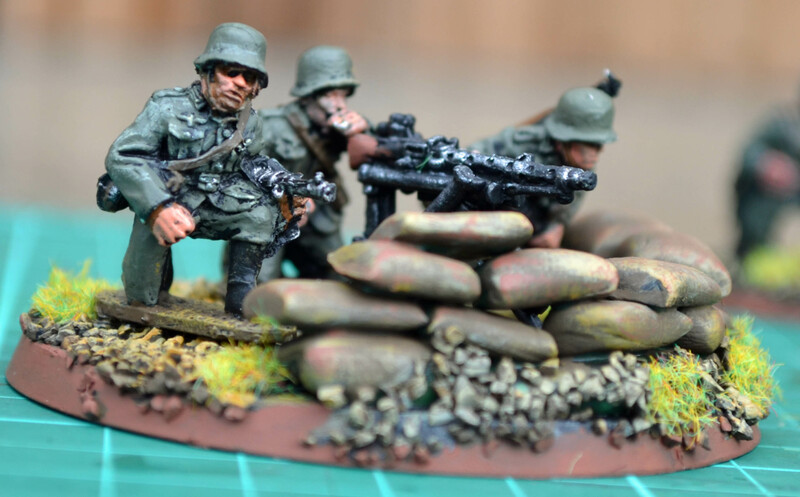 They are still my only painted 28mm WWII. At 1,000 points I left my Tiger at home and gave my Stug III a run instead. I faced Soviets twice and the US once. I didn’t win a sausage all day, but had a cracking good time. Round 1 Loss to Rick Vaveliuk’s Soviets. I ran out of momentum (and men) in the centre, while a T34 demolished my supply dump on turn 7 to turn a draw into a good win. Round 2 ‪Another loss. Soviets again. Having trouble keeping the Bolshevik hoards back today. Kittyhawk Down and a great game. Round 3 Loss to Chris in hold until relieved. Turn 3 just saw my Germans taking too many pins and I failed order tests across the board. Clear victory to the marines. 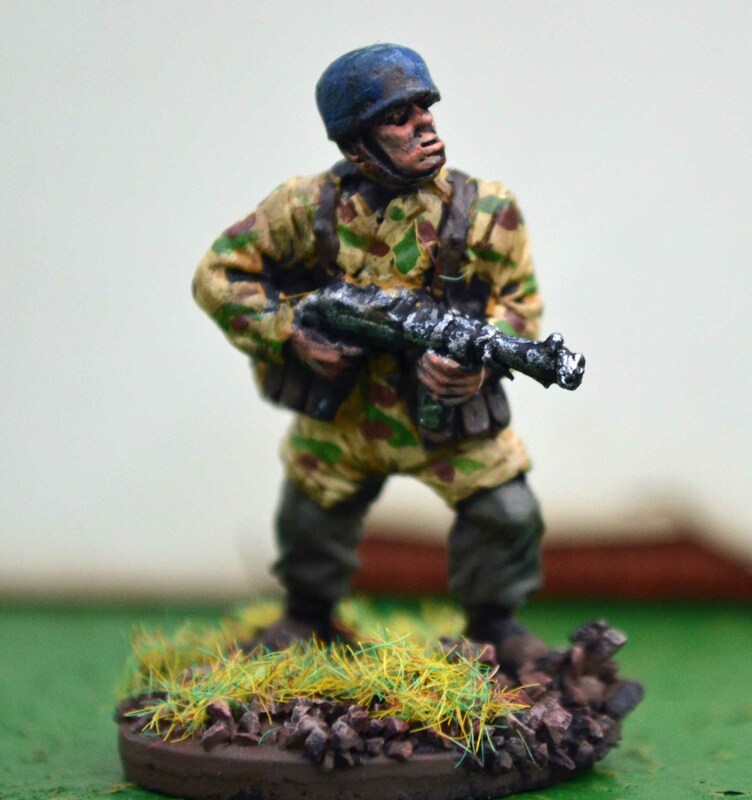 I attended Operation Cleanslate, a one day Bolt Action tournament held at Games Laboratory in Melbourne. One day, three 1,250 point games and 15 players is a recipe for a top day. I took a Tiger supported by a lot of mid-war grenadiers (and a squad of SMG armed fallschirmjager). A minor bum note was although I had Germans, I played against Germans in all three rounds. My opponents more than made up for this historical aberration. And, it was interesting to be on the receiving end of Hitler’s Buzz-Saw for once. For once I remembered to take photos. Game one: Demolition, against Garret who had a German armoured company. No tanks though, it was all half-tracks with various gadgets and just two infantry squads, both veterans. Garret is a gentleman but he knows Bolt Action and I had my work cut out right from the start. It didn’t help that my Tiger got lost on the way and didn’t arrive until turn 6! Just in time to take out his command vehicle and his most expensive unit, but too late to help defend my objective or destroy his. I did OK, and thought I might get a draw but with pins piling on I couldn’t get forward as my squads went to ground. An 8-16 Loss. Game two: Point Defence. Off to the ruins of Stalingrad for a fight against Robert’s DAK (man, they must have really pissed Rommel off to get posted to the Volga!) A wonderful board to fight over, I thought I played it well keeping the DAK at bay and keeping my units alive in depth on two of the three objectives. Lesson this game: read the mission. Point Defence defender only wins if they hold all three objectives. I chose to defend two objectives in depth, largely ignoring the other one, which left me playing for a draw right from turn one. Doh! 12-11 Draw. Game three: Kittyhawk Down! Another German armoured list, against Aaron on a very open board. While there was some line of sight blocking, there was nowhere to hide. Kittyhawk down really starts at turn 4, when a Kittyhawk crashes at a random spot along the centre line of the table and becomes the objective. It comes down with a bang, exploding with the effect of a medium howitzer. I lost an entire squad in the wreckage and went from being in a good place to being on the back foot as truck loads of (opposing) vets poured onto the objective. The end result was a draw, 12-13 Aaron’s way, but if we had gone to turn 7 it would have been all his. Tigers are ace. They can take a lot of damage and they are a one hit one kill unit. But they take a lot of points and will still accumulate pin-markers. This means that the rest of your army needs to work hard to take and hold objectives. To win with a Tiger list you need to stay focused on the mission and know your army. Actually, that is really just advice for winning with any list. See you on the battlefield. Maybe even the next BA event. I plan on attending another tournament shortly, this time Bolt Action. Because they are the only painted WWII I own I will be taking my Germans. But, because I have a recently assembled and painted Tiger (well, almost painted: decals and weathering to go), I plan on including it in my force. The tournament is 1,250 points, so at 395, the Tiger is a big bite out of the budget. Collective wisdom seems to be that it will be hard to make it pay. But Tiger. The rest of the army will be squads of Heer grenadiers (four of them, I think), plus one of SMG armed Fallschirmjager. Support will include teams of snipers, MMG, mortars and I think a panzerschreck. All led by a second lieutenant. A pretty standard German list, except for the Tiger and, probably lack of a forward observer. Perhaps more troops some, but I find plenty of units that can take and hold objectives are often very important in tournament type missions. 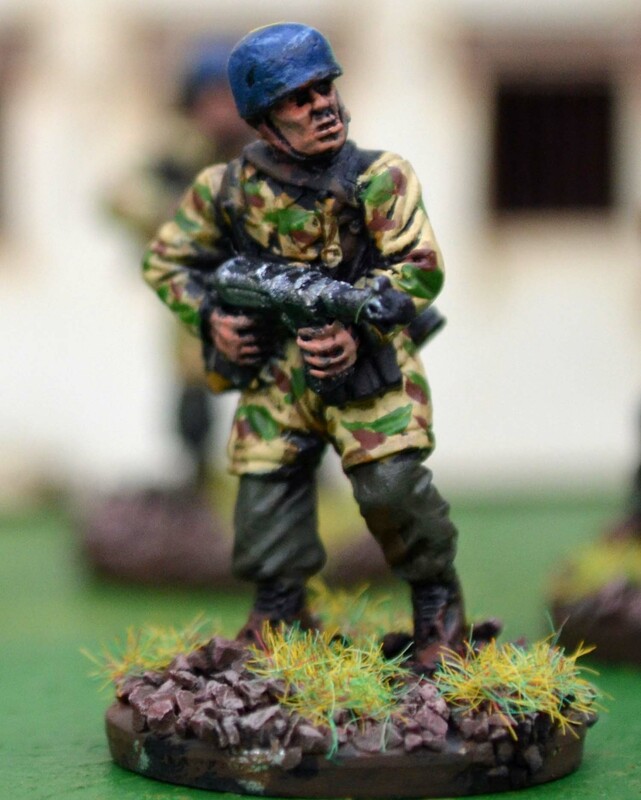 As I flagged in my last post, I intend to support my Heer with some of the elite Fallschirmjager armed with SMG. Their role will be to either push forward and take objectives or hold back as threatening reserve depending on the mission. I’ve taken advantage of one of the regular sales at Black Tree Designs to obtain the miniatures. I’ve grown to love their slightly odd-shaped heads: no poster boys here, these bruisers have trained hard and mean business. I was initially a bit daunted by the camouflage, but I discovered that once the base coat was done the pattern itself doesn’t take all that long. I chose to make their helmets a brighter blue than they probably were so the squad will stand out on the table, easily identifiable as paratroopers, making them distinct from the regular grenadiers and other specialist units (like the snipers who are also in camouflage). I wanted to include a panzerfaust as a sort of 5 point insurance policy. 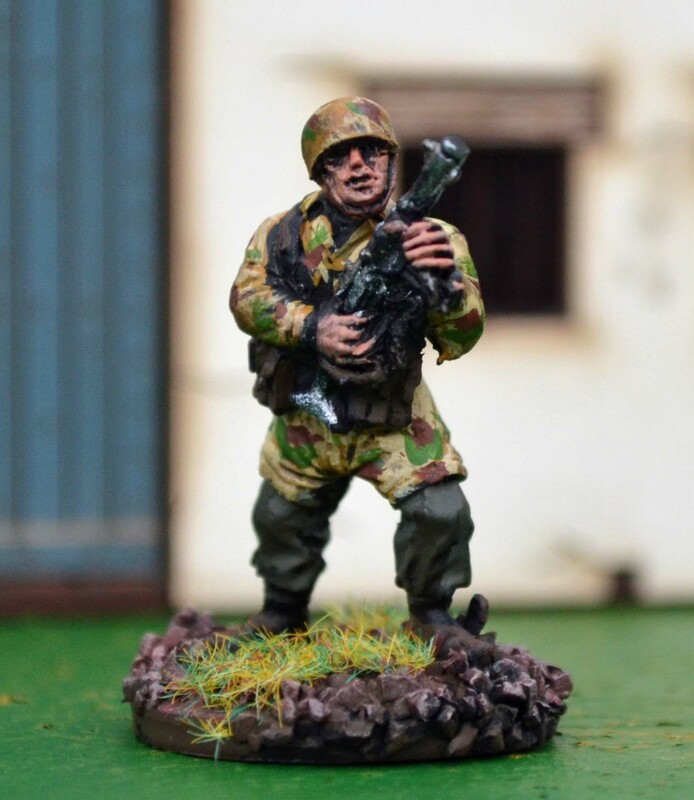 Once I started painting I realised that what I thought was a paratrooper is actually a Warlord Games SS trooper. If you squint it just might be an unbuttoned jump-smock. At 5 points using the Format Season 2 rules it is also hard to pass up a squad LMG. I’m almost ready to go for the Bolt Action Melbourne August (BAMA). 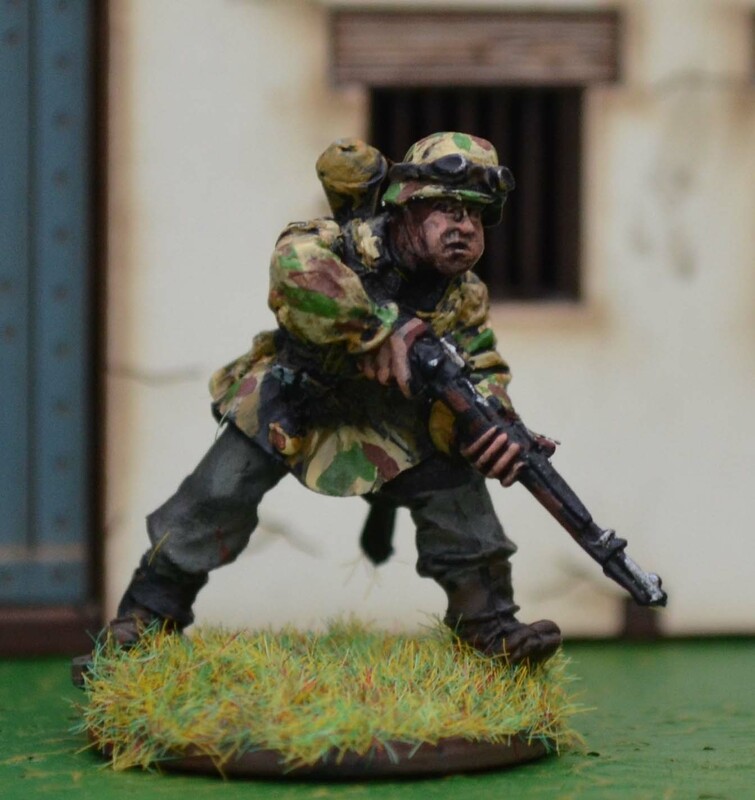 As the only painted 28mm models for the second world war that I have, I will be taking my Heer. We’re using 1,000 point lists so I will be able to include the reinforcements I posted recently of a sniper team, Arty FO and a kubelwagon. My list has a lot of boys, which I suspect is a little under-optimised compared to some tournament players. Rather than other toys all of my infantry squads have LMG. I know some folk think LMG are a bit of a waste. But theme. 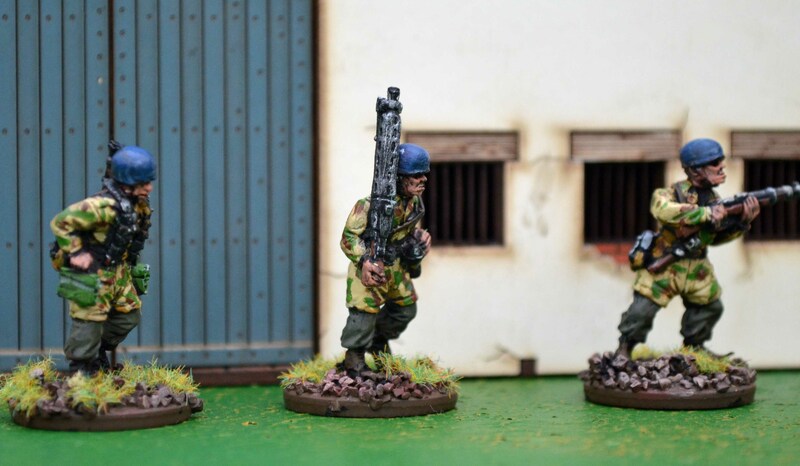 And, since we are going to use Format Season 2 rules (check them out over at boltaction.net), at 5 points per squad LMG I found I had enough change for a medic. Medics are great. My list is themed around the determined defenders on the Gustav line, who absorbed enormous damage from the equally determined Allies pushing up the Italian peninsula but dealt a lot of damage in return. A forward observer will represent the artillery that was such a big part of the fighting at Monte Cassio and in the hills behind Anzio. And 100 points for something that gets one shot that might come down on your own head, well that is hard to pass up. Snipers also appear in the accounts that I have been reading and with close to one shot one kill, these guys will generally pay for themselves each game. By early August I will have a squad of the iconic Monte Cassino defenders, the Fallschirmjager, ready to go. These boys should be able to go and do the hard jobs, supported by the grendadiers of the regular army as needed. No photos this week, because I’ve already posted the painted ones in earlier posts and the paratroopers are still just base coated. Time to head to the painting desk. I really enjoyed my first three games of Bolt Action, courtesy of the Opening Skirmish and hosted by the Hampton Games Club. Fine fellows all. While I’ve seen some grumbling on different forums that BA is “not historical” and Chains of Command from Too Fat Lardies is better; I’ve also seen folk raving about how much better than Flames of War it is. My take is that this wargaming caper is pretty broad church. Did I mention that I enjoyed the games of Bolt Action that I’ve played? The dynamic of drawing lots for which unit acts next creates terrific a tension as you try to execute on your plans and thwart your opponent, it also has the unexpected bonus of keeping both players very much engaged the whole time. There is no opportunity to duck out for a fag (if that’s your thing). The experience of having both players involved the whole time is good. The pinning dynamic is a great abstraction of the growing tension of keeping troops together under fire. I like the ability to stymie even veterans and other tough units through suppression fire even if you don’t have the ability to really destroy them. This really brings the officers into the game too, to keep your troops going forward. I was pleasantly pleased that historical tactics are rewarded particularly fire and manoeuver for squads. Machine-guns and mortars are dangerous don’t play with them unsupervised, kids. Even without really knowing the rules, I found I could be competitive on the day by focusing on tactics. This has to be a good thing ™. The scenarios are a really important and integral part of the game. A part that might be underplayed by players more used to points based meeting engagements. Adding more scenarios rather than more troop types or rules will be a terrific way to keep this game challenging and fresh. I think this is showing up in the new theater books, something I will have to investigate. So an ace day. Thanks to my three opponents: Josh (commanding some British paras); Brad (leading DAK); and Tom (with some veteran Germans). Worthy opponents for my Germans. Thanks to Brad from LRDG – and now Ghost Army (link to podcasts)- for organising and the very generous sponsorship from War and Peace Games and Warlord. Every player won a prize on the day. Nice work. Now back to the painting table to add the next 250 points. December 6 will see a one day Bolt Action tournament and given I’ve been painting some Germans, I’m going to give it a go. My first three games, so should be interesting. Here is the list I’m going to take. I’ve themed it around one of the infantry divisions that fought in Italy around Monte Cassino. Following its destruction in Stalingrad along with the rest of the trapped 6th Army, the 94th Infantry Division was recreated in 1943 and moved to Italy, initially in reserve. In December 1943, the 94th was assigned to the 10th Army under Field Marshal Kesselring and fed into the line as part of the defence of Monte Cassino. The grenadiers of the 94th had a lot to live up to, fighting alongside highly trained and motivated fallschirmjager, and with a strong desire to live up to their comrades who had died in Der Kessel only twelve months prior. All regular for a total of 750 points with 8 order dice. I’ve submitted the list, so while suggestions are welcome, there is no going back.